Subunits of each class assemble into cation channels, which are mainly permeable to sodium, potassium, and, to a varying degree, calcium; GluR6 receptors containing R at the Q/R editing site (see Section 3.4.) are also permeable to chloride (42). In native and recombinant receptors, to date only subunits within a given family have been shown to coassemble (e.g., AMPA receptor subunits assemble with AMPA but not kainate or NMDA receptor subunits). The properties of the receptor are determined by which subunits assemble and only certain recombinant subunit compositions have been found to form functional channels. Coimmunoprecipitation of two subunits by an antibody directed against one subunit has been used to suggest which subunits coassemble in native receptors (Table 3; also see review in ref. 49). The very N-terminal regions of AMPA receptor subunits appear to determine the specificity of subunit assembly (50,51). Recombinant AMPA receptor subunits seem to assemble in all combinations as homomers or het-eromers. Most cells in the brain express more than one AMPA receptor subunit mRNA, and immuno-precipitations from the hippocampal CA1 field revealed mainly heteromeric complexes (47). 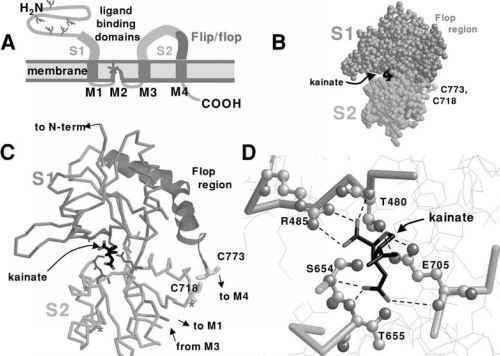 Functional kainate receptors appear to require the expression of GluR5, GluR6, or GluR7; KA1 or KA2 have not been found to form functional channels by themselves. In mammalian cells, functional NMDA receptors require the expression of NR1 subunits together with one or more NR2 subunits. The NR2 subunits influence many properties of the receptor, e.g., desensitization and deactivation rates (reviewed in ref. 3). It is still not clear whether ionotropic glutamate receptors are tetrameric or pentameric. At least two different NR1 splice variants can coexist in one receptor complex (52,53), which implies that there can be more than one NR1 subunit in one complex. Hawkins et al. (54), using FLAG- and c-myc-tagged NR2B subunits, showed that the NMDA receptor can contain three NR2 subunits: one NR2A and two NR2B subunits. Assuming that two NR1 subunits occur in the NMDA receptor complex, a pentamer is possible, although most biophysical studies are more consistent with a tetrameric structure (e.g., refs. 55-57, but see refs. 58 and 59). Convincing resolution of this issue will require large-scale receptor purification or perhaps high-resolution imaging of the receptors. The transmembrane topology of the ionotropic glutamate receptor subunits with four domains buried in the membrane (M1-M4) is shown in Fig. 3A. Only three of the membrane-buried regions are transmembrane domains (M1, M3, and M4). The M2 domain is a re-entrant loop and contributes key amino acid residues to the inner wall of the open channel. With their M2 loop, GluRs resemble more the potassium channel structure than other receptor ion channels with four transmembrane domains (e.g., nicotinic acetylcholine receptors). Part of the extracellular N-terminus and the region between M3 and M4 form a clamshell-like agonist-binding site (Fig. 3B-D), which was crystallized and the structure solved for the GluR2 subunit by Armstrong et al. (60). A conserved amino-acid-binding pocket is proposed to exist in all glutamate receptors. This pocket is formed from two globular domains (S1 and S2) drawn from the sequence adjacent to the Ml domain and the M3-M4 loop, respectively. One interesting conclusion from the crystal structure is that the ligand-binding pocket appears to be contained within a single subunit rather than lie at an interface between two or more sub-units. This arrangement could therefore result in multiple agonist-binding sites in each functioning receptor. Kainate binds deep within the S1-S2 cleft, in the process contacting both lobes of the closed form of the clamshell structure. Agonist binding and subsequent closure of the clamshell structure could lead to channel opening by creating a mechanical force or torque on the receptor that is transmitted to the transmembrane region, which, in turn, could increase the likelihood that the channel structure itself undergoes a conformational change to the open state (60,61). 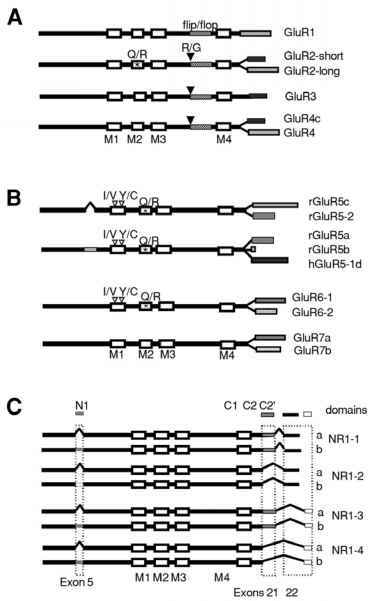 Several splice variants are known for most ionotropic glutamate receptor subunits (Fig. 4) and the different exons confer various properties. Among the AMPA receptors, the alternative flip or flop exons determine the desensitization kinetics of the receptor. The flip variants are typically more slowly desensitizing and are expressed in embryonic and adult animals, whereas flop variants appear later around postnatal d 8 in rats and continue to be expressed in adult animals. Similar to the metabotropic glutamate receptors, alternatively spliced C-termini occur for most of the AMPA and kainate receptor subunits with as yet largely unknown function (but see Sections 3.6. and 3.7.). Among NMDA receptor subunits, only the NR1 subunit is known to be alternatively spliced, namely, in exons 5, 21, and 22. This results in three NR1 C-terminal isoforms, named Cl, C2, and C2', and within the N-terminal NR1 domain, exon 5 (domain N) can be present or absent. So far, no splice variants among the NR2 subunits have been found. Relative to the NR1 subunit, NR2 subunits contain a much longer intracellular C-terminus. Fig. 4. Splice and editing variants of alternatively spliced ionotropic glutamate receptor subunits. The diagram shows the basic structures of ionotropic glutamate receptor subunits, the regions buried in the membrane (white boxes, M1-M4), and the alternatively spliced cassettes (boxes with different patterns). Within the AMPA, kainate, or NR1 subunit variants, the homologous alternatively spliced domains are indicated by the same pattern. (A) AMPA receptor subunits with flip/flop and C-terminal splice variants. The position of the Q/R and R/G editing sites are indicated. (B) Rat(prefix r) and human (prefix h) kainate receptor subunits with C-terminal and N-terminal splice variants. The editing sites I/V, Y/C, and Q/R in the Ml and M2 domains of kainate receptor subunits are shown. (C) Alternative splicing of NR1. Exons 5, 21, and 22 are alternatively spliced, giving rise to the cassettes Nl, Cl, C2, and C2'. No splice variants of the NR2 subunits are known at this time. mice were rescued when both GluR2 alleles (Q) were modified to encode for the edited (R) version of GluR2, suggesting that GluR2 is the physiologically most important substrate of ADAR2 (65).